Media captionEver had a date that ended like this? 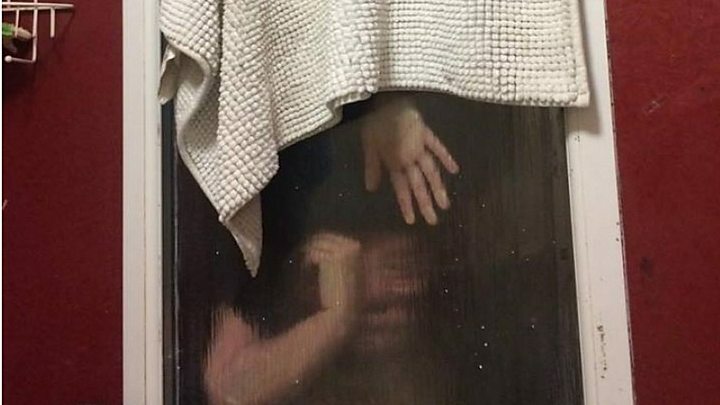 A woman who became trapped between two windows on a first date - in which she threw her own faeces out of a window - says it was all a "terrible mistake". The anonymous woman, from Bristol, was trying to retrieve her waste after finding her date's toilet would not flush prompting her "panic response". The rogue poo unfortunately got stuck between two non-opening windows. Posting on Reddit, she said ever since friends had been comparing her to the hapless TV comedy character Miranda. The BBC has attempted to verify the anonymous date's identity but the person posting has not responded yet to the messages. This story first appeared on a crowdfunding page, set up by her date, University of Bristol student Liam Smith. Mr Smith, was attempting to raise funds to fix the broken window in his shared house, and has now raised £2,500. He said the extra money would benefit two charities, one supporting firefighters and another that builds and maintains flushing toilets in developing countries. His date said the toilet itself did not have a lid and was "honestly an awful loo", but that Mr Smith was "so good" about the situation. "I swear I was literally on my knees cringing and apologising. He was so good about it though, just laughed with me rather than at me. "It was one of the hardest things I've ever had to say. "I reached down into the window and slipped too far. My hips were wedged in the window, [so] I was upside down inside the window. "I was suspended upside down for probably half an hour, I felt sick and had some quite nasty marks on my skin." Mr Smith said the toilet window opened into a narrow gap separated by another double glazed window. "It was into this twilight zone that my date had thrown her poo," he said. Asked if she considered leaving it there, she said: "I feel like if I had, and he'd found me out after, I'd probably be in a worse position now." She added: "It's not something I'm proud of, but people are laughing, and if I'm making people happy then I'm not going to complain." She confirmed the pair had met for a second date. "As for a third date... I'm not sure," she said.